Asia / L’ASIE (Jan Barend Elwe) – 1792. 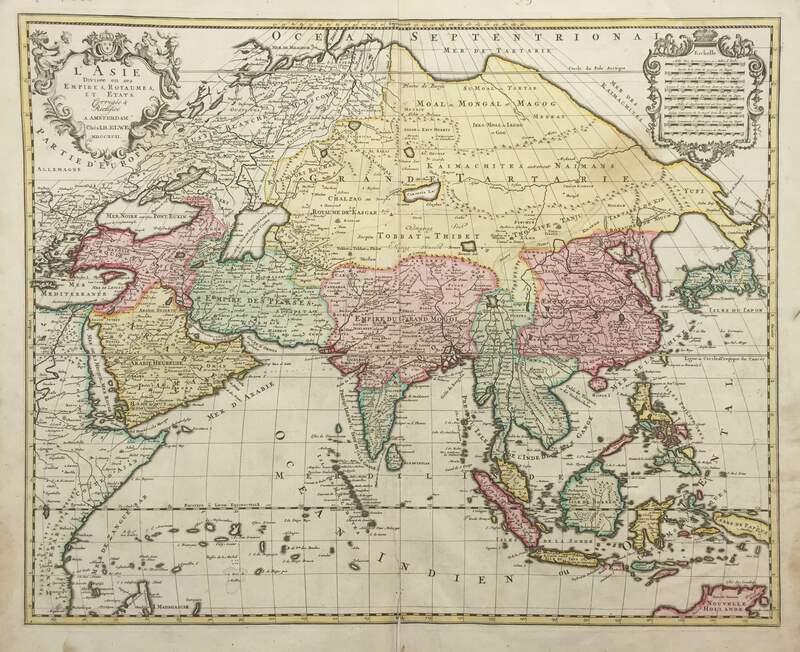 An attractive late 18th century map of Asia from the East African coast in the west to Papua-New Guinea in the east in original colour by the Amsterdam bookseller and publisher J.B. (Jan Barend) Elwe (fl. 1785-1809) and published in Atlas in 1792. Elwe’s contribution to atlas production was slight; all he did was to print a number of maps from old plates, with some originating from the Ottens, after deleting their name and adding his address. However, his four-sheet map of Indian and South-east Asia including the East Indian Islands provides a very large, attractive and relatively rare coloured map of the region. These four maps were published in the same Atlas as this map of Asia. Good condition apart from some professional repair work along the centerfold and a small late 19th century ma of Thailand pasted onto the verso. Measures 46.8 x 58.2 cm, (plate).